Gestural inputs are nowadays widely applied to in-car interactive systems. The emerging sensing technologies allow for micro-gestures that can be achieved with less energy and are performed probably when the driver is grasping the steering wheel, thereby reducing the user attention to human–vehicle interaction. The movability of hands and fingers has to be considered before designing micro-gestures for driving scenarios, thus the newly defined gestures may be utterly different to the familiar multi-touch or body gestures. 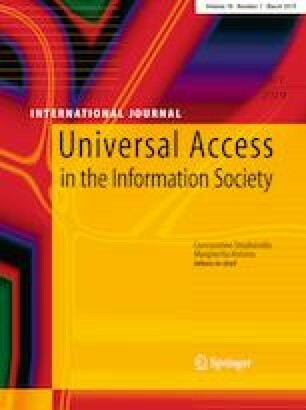 This paper presents a set of micro-gestures which are designed for intuitively commanding the in-car information system by taking both the gesture meanings and physical limitations into account. The study sets out the results of evaluating the feasibility of gesture sets with its performance in dual-task situation. The learnability and intuitiveness of micro-gestures as well as the effects they have on driving tasks are evaluated, and the effects of different grasping postures on the performance of novice drivers are also compared. It is concluded that the micro-gestures particularly designed for the grasp interface have advantages in multi-tasking, and they are appreciated by users who participated in the evaluation test. The study protocol conforms to the ethnical standard of the institutional committee and to the declaration of ethical principles adopted by the 18th WMA General Assembly, Helsinki, Finland, June 1964 and its later amendments. The Queen Mary Ethics of Research Committee approved the study protocol which includes all procedures performed in this study with the following reference number QMREC1749a. Informed consent was obtained from all individual participants involved in the study. This paper does not include any studies with animals conducted by any of the authors.